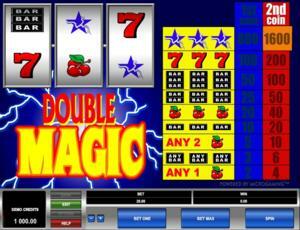 Double Magic is a classic online video slot game from Microgaming that has been released in November 1999. This online video slot machine game has 3 reels and 1 pay line. The theme of Double Magic is about the wonders of magic (you cannot see but feel) that can potentially change your life in an instant! Many online slot players love playing this classic slot machine game as it brings out a genuine impression of a real land-based casino slot machine in every way. The Double Magic online slot game is perfect for beginners to learn the basics of 3-reel, 1-pay line slots as well as it is a great way to spend time leisurely if you are already an expert in online slots. Overall, if you are looking for a simple classic 3-reel slot game without many things to think about, then Double Magic is the right slot machine for you! Most Microgaming online slot games are available in 2 formats. The first format is the one preferred by most players, which is the download format. The second format is the Flash or browser-based version, which means there is no need to download anything at all. Whether you like to download or not, Microgaming has slot games for all your slot gaming needs. Good thing that Double Magic is available for instant play, so you do not have to download anything to find out if this game interests you enough in a way that you would like to spend some real money on it. Have you ever thought about what kind of magic can make you rich? While in the real world, magic is typically an act of illusion and fast-paced hand movements, Double Magic can help make your dream of winning the jackpot prize come true! Furthermore, if you loved watching magic tricks ever since you were a kid, then you will surely love playing the Double Magic online slot game as it features 3 reels and 1 pay line, no fancy stuff to remember, a wild multiplier symbol that can double or quadruple your payouts, a maximum coin jackpot of 1,600, a maximum cash jackpot of $8,000, and it even has an Autoplay function to make your game play easier and more exciting! The quality of the graphics and sound provided by Microgaming software is without doubt brilliant. They possess a track record of generating the most spectacular graphics and realistic sound effects. A lot of online slot players love Microgaming because its online slot games have smooth animation and remarkable yet non-intrusive background music and sound effects. Since it is essentially a no-frills type of slot game, Double Magic has been designed to look like a simple classic slot game with matching sound effects. The casing of the reels includes the reels, buttons and the payout table. The overall graphic design of Double Magic shows the Double Magic title of the game with sparks behind it, and the main background of the reels is a deep blue. The colors used in the game include red, orange, yellow, green, black and white. In Double Magic, the background music and sound effects you will hear are very similar to the ones you will find in land-based casinos. Whenever you spin the reels, simple sounds common in land-based traditional slot games will be heard; and when you manage to form winning combinations, simple sounds common in classic arcade games are played out. There are no regular card deck symbols available in the Double Magic online video slot game. The regular symbols that you will find in the Double Magic slot game are the 3-Bar, 2-Bar, 1-Bar, the Seven, and the Cherry. The Wild Symbol is the Blue Star. It is a wild multiplier symbol. Thus, the Blue Star wild symbol not only acts as a substitute for all other symbols in order to you help you form winning combinations, but it also can multiply the payout! One Blue Star wild symbol doubles your payout whenever it completes a winning combination. Two Blue Star wild symbols quadruple your payout whenever it completes a winning combination. Three Blue Star wild symbols complete a winning combination (see payout table), but your winnings are not multiplied. There is no Scatter Symbol in the Double Magic online slot game. Since Double Magic is a traditional, old-school 3-reel slots game, there are no bonus features in this game. Double Magic has 3 reels where you may bet on 1 pay line only. The minimum bet is 0.25 and the maximum bet is 50.00 per line. You can wager from 1 up to 2 coins per pay line. Thus, the minimum amount you can bet is 0.25 and the maximum amount you can bet is 100.00 per spin. A single Blue Star symbol on the pay line doubles the winning combination it completes. Two Blue Star symbols on the pay line quadruple the winning combination they complete. Three Blue Star symbols on the pay line do not multiply your payout, but they complete a winning combination. The maximum payout in the regular Double Magic online slot game is 1,600 coins. Online video slots are much easier and more fun to play when it has an Autoplay function. In Microgaming online slot games, they have 2 game modes – Regular mode and Expert mode. If you would like to play the Double Magic online video slot game automatically, all you need to do is access the Autoplay function by clicking on the “Expert” button located at the left corner of the game screen. In it, you will find the Autoplay setting that lets you play a desired number of consecutive spins automatically.